Breathtaking and RARE...RARE! 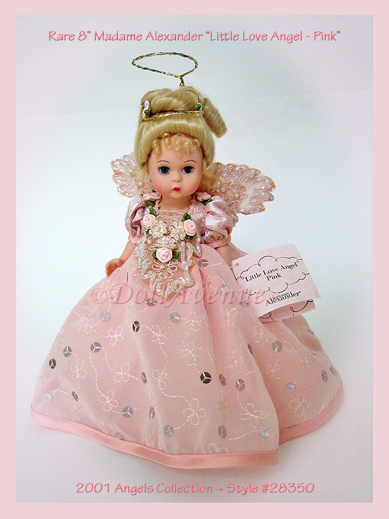 2001 "Little Love Angel- Pink" is one of four dolls from the Madame Alexander Angel Collection Introduced in 2001. Beautiful upswept blonde hair with delicate rosettes adorning the crown and soft curls on her forehead. She's dressed in a pale pink gown trimmed in exquisite detail with sequins, seed pearls, rosettes and embroidery. Befitting of the most precious of angels, this little gal wears delicate pink angel wings on her back and pink satin fabric shoes with gold threads. If you're looking for that special doll that is rarely found, this is the doll for you! She will come to you in excellent condition in her original box with handtag and registration card. *Click the link below to see a large view of this beautiful doll.